Affordable and upgraded, the search is over! The perfect home to start a family, nestled in the back of a quaint cul-de-sac on an oversized lot. No expense spared or detail missed, this home features laminate flooring, crown molding, granite counters, vinyl windows, vaulted ceilings, stainless steel appliances, and plantation shutters. Perfect for entertaining with an expansive wrap-around covered patio and sprawling backyard with plenty of room for barbecues, celebrations, or the future addition of a pool. The backyard has 2 avocado, 1 cherry and 2 lemon trees. Enjoy membership to Lake Mission Viejo including boating, beaches, a swimming pool, concerts, fishing and family fun events year round. 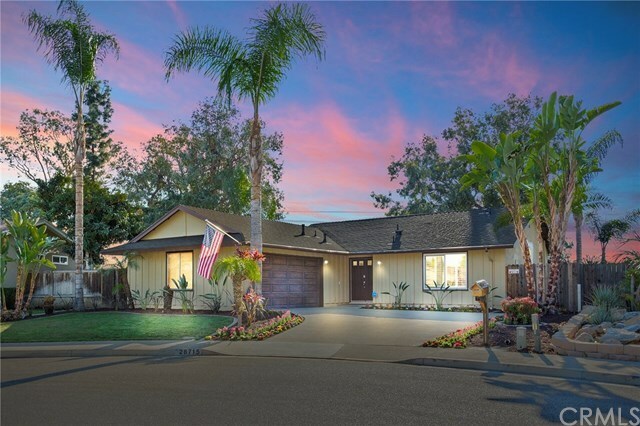 A short walk to Coronado Park, the Arroyo-Trabuco Orange Golf Courts, Mission Viejo Mall and close freeway access. Schedule a showing before this beautiful home slips by.